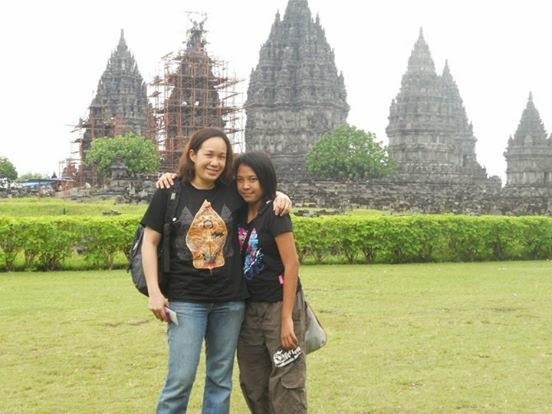 The beautiful and majestic temple of Prambanan is an icon of Indonesia's cultural heritage. It is not too far away from the Adisucipto International Airport , so when I arrived in Yogyakarta, it was my first destination. 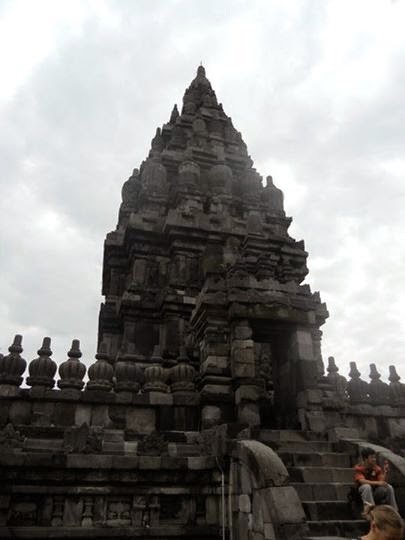 us that on Java, Buddhism and Hinduism lived peacefully next to one another. 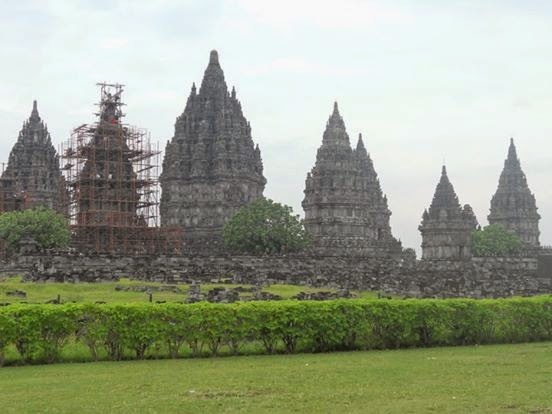 Prambanan is known locally as Roro Jonggrang, coming from the legend of the ‘slender virgin’. According to the legend once upon a time, there was a young and powerful man named Bandung Bondowoso who was also a sorcerer. He wanted to marry a beautiful princess named Roro Jonggrang after a war and killing the king there. Roro Jonggrang did not love him, (for how could she love her father's murderer) yet could not find a way to refuse him. She finally agreed but only if Bondowoso built her 1,000 temples in one night before the break of dawn. She insisted that the buildings must be completed before the rooster crow, something she believed was impossible. But with the help of genies and his own magical powers, Bondowoso managed to complete 999 temples. Panicking, Jonggrang told the women of her village to start pounding rice so that the rooster would wake up and begin to crow. When Bondowoso heard this he was deeply disappointed and enraged. When he found out that Roro Jonggrang had made the roosters crow, he turned her into stone. 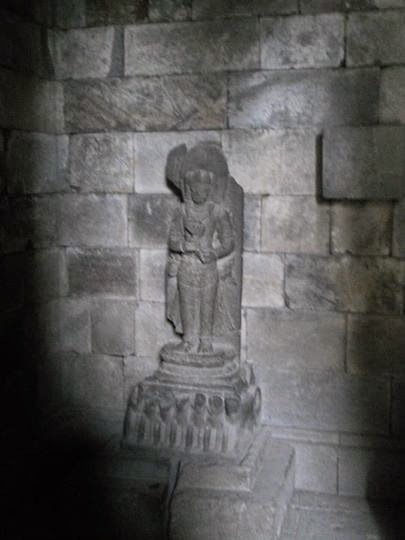 The statue of a slender virgin graces the main Prambanan temple, while a group of temples nearby is called the Candi Sewu or the Thousand Temples. Could this be Roro Jonggrang's statue? 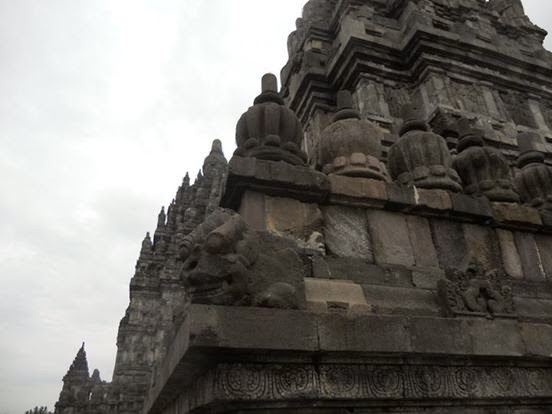 The temples at Prambanan were built in the 9th century. The biggest temple is dedicated to Shiva – the destroyer, and the two smaller ones which sit on its right and left are dedicated to Brahma -¬ the creator and Wisnhu – the sustainer. 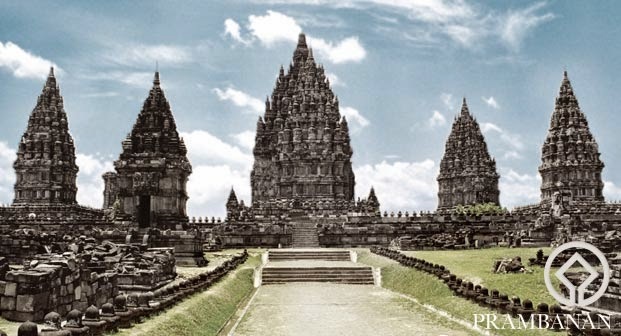 The tallest temple of Prambanan is a staggering 47 meters high. Its peak visible from far away and rises high above the ruins of the other temples. Jamie and I at one if the main buildings. 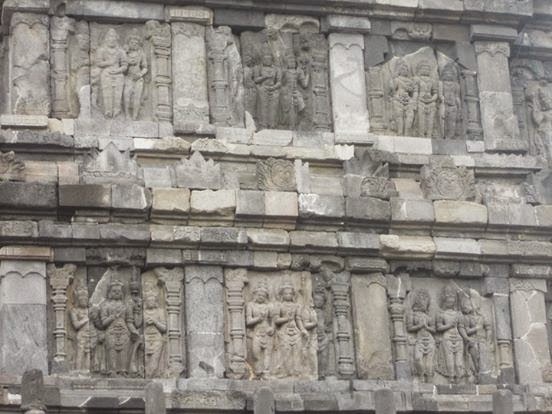 The temple was damaged during the May 2006 Java earthquake. Early photos suggested that although the complex was structurally intact, the damage was significant. Large pieces of debris, including carvings, were scattered over the ground. 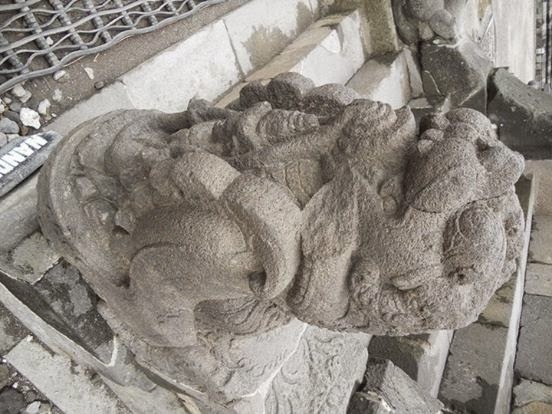 The temple was closed to visitors until the damage could be fully assessed. And when Jamie my niece and I visited the place, some of the sites and buildings were still being restored. 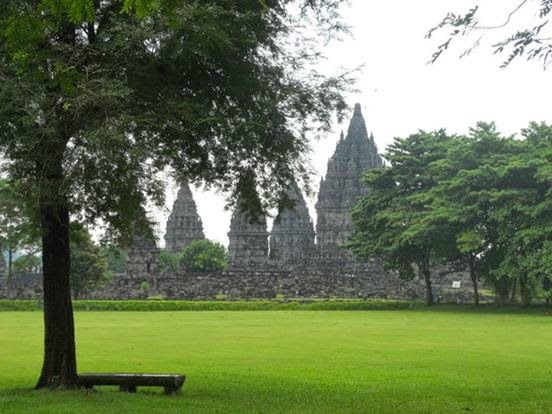 You can wander around the Prambanan on foot. 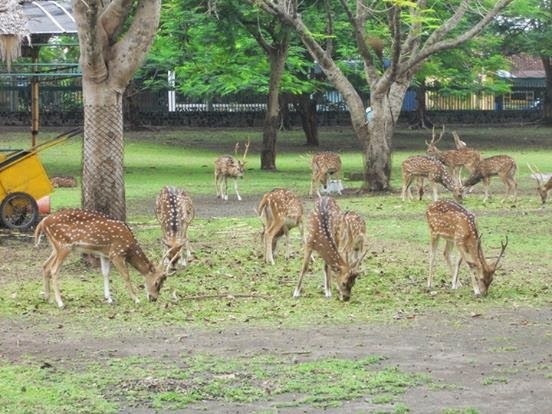 This is the best way to enjoy the lush landscape, even see the deers in a garden nearby in the compound and take in the beautifully detailed architecture and design of the temples up close. I just loved walking around there. This temple compound covers 39.8 hectares. 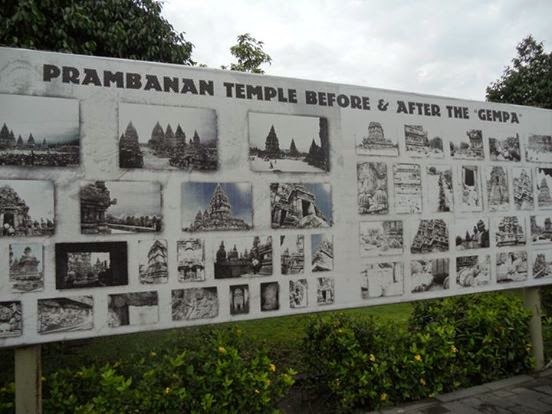 In the main yard, there are the three main temples, as well as three Wahana temples, two Apit temples, and eight Patok temples surrounded by fences. In the second yard, there are another 224 Perwara temples. Wandering around here and examining the intricate stonework will be enough to keep you busy all day! 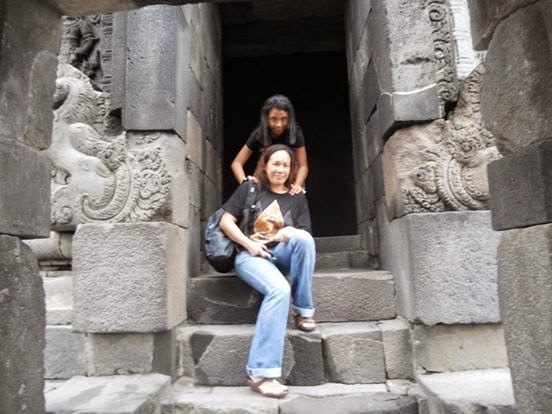 They said compared to the temples in Angkor Wat, the temples of Prambanan are much easier to navigate and more tourist-friendly, after having been to both places, I have to agree. 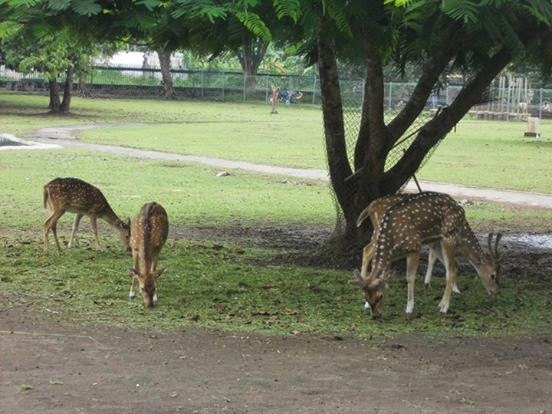 The area surrounding Prambanan is developed, with a landscaped park and stores selling tourist souvenirs. The beauty of the temple can make forget your surroundings. I just love these ancient temples. They bring my imagination back to an ancient time where ritual and culture dominated every part of life. 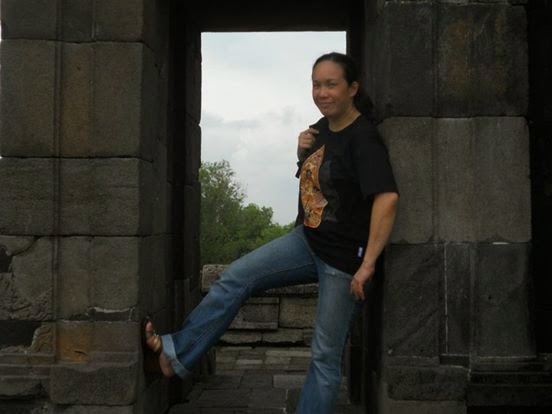 Ratu Boko Palace and Prambanan are close together. There is even a free shuttle van between the two. So you can do these the in the same day. The trip however is a little scary as the roads navigated are pretty narrow but you can definitely enjoy lovely Indonesian villages and paddy fields along the way up the hill. 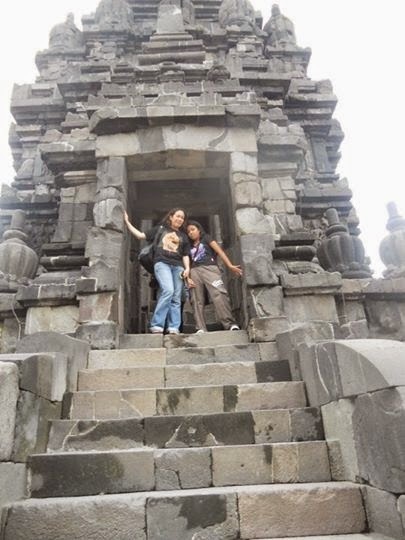 Standing majestically on a hillside plateau overlooking the Prambanan temples and the mystical Mount Merapi as its backdrop, the Ratu Boko Palace ruins are the remnants from the glorious 8th century golden age of ancient Javanese kingdoms. 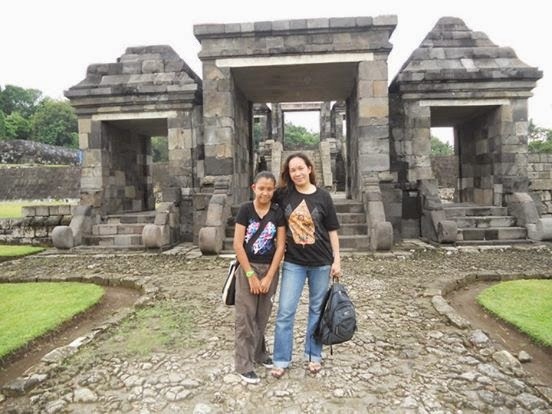 Located approximately 17 km east of the city of Yogyakarta in the sub-district of Bokoharjo, Sleman Regency, the Ratu Boko Palace Complex is a unique archeological site which features a meld of Hindu and Buddhist architecture. The site takes its name from the legendary king Boko, one of the main characters in the famous folk legend of “Roro Jonggrang”. 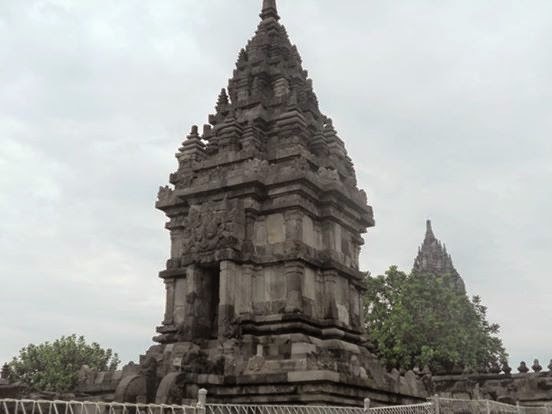 This folklore links the Ratu Boko Palace with the Durga statue in the Prambanan temple, and with the Sewu temples, or the Thousand Temples near Yogyakarta. 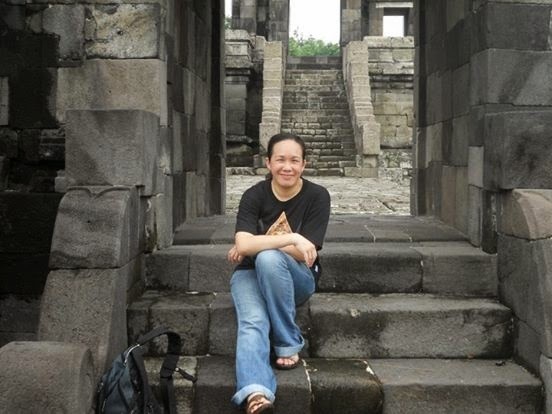 The history of Ratu Boko is unclear, and much of what is understood about the site comes from inscriptions and even folklore. 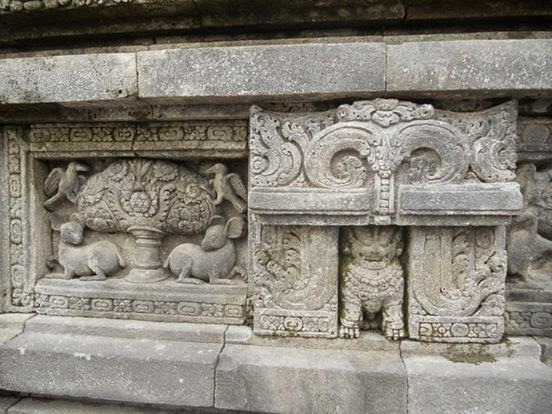 The oldest inscriptions found on the site is believed to date back to 792 AD, naming the site Abhayagiri Wihara. 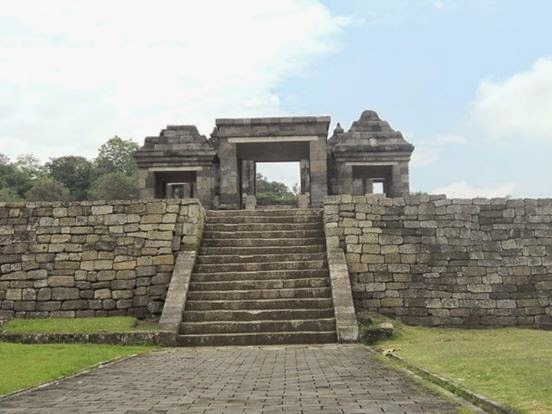 Archaeologists believe that the ruler of the Saliendra Dynasty Rakai Panangkaran, built the palace of Ratu Boko between 760-780, after he relinquished his throne. It was then tradition among ancient kingdoms for ageing kings to retire in order to find spiritual peace and concentrate on religious matters. Thus, the Abhayagiri Wihara meaning ‘peaceful Buddhist monastery’ was built on this site with its spectacular view. 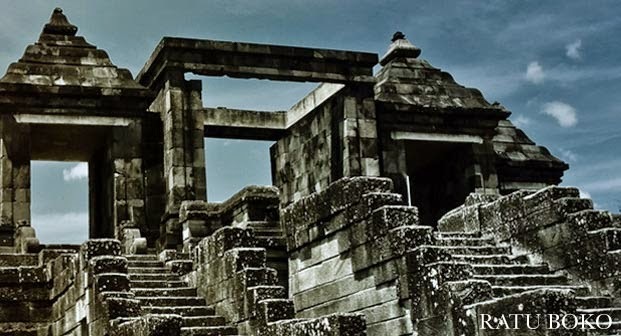 Ratu Boko stands 196 m above sea level and covers an area of 250.000 square meters . It is divided into four parts, the center, the west, the southeast and the east. The central section of the temple consists of the main gates, a crematorium temple, a pool, a stone pedestal and the paseban (or audience hall). 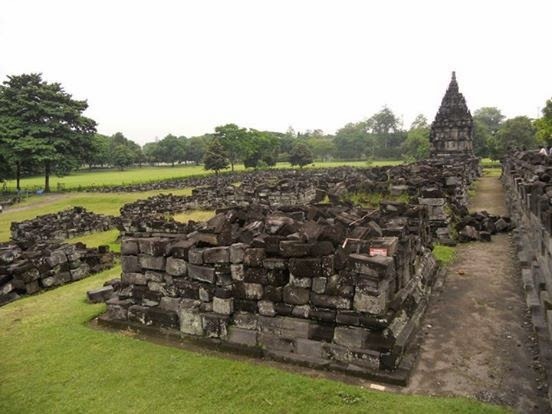 The southeast part covers the pendopo (attached open veranda which serves as an audience hall), balai-balai (public hall or building), three temples, a pool and a harem complex. In this part there is also a well called the Amerta Mantana which literally means “holy water”. It is believed that the well water had a virtue to bring luck to those who drink it. On the east side, there are a cave complex, a Buddha stupa and a pool. Many of its original constructions which were made of wood were destroyed through the ages.